There's an elaborate old system of buzzers and lights in the Capitol that blast out coded messages to busy lawmakers. The "legislative call system" uses different combinations of long and short rings to send out updates on quorum calls, floor votes, and civil defense warnings. The earliest incarnation of the call system was installed in the Capitol building in the 1890's. Successive generations were added on as the new congressional office buildings opened throughout the 1900's. The legislative bells are an ever present fixture on in the Capitol complex, and legend has it that area restaurants traditionally also "signaled a vote to congressional diners by ringing bells or buzzers." The most widespread clock and buzzer designs are pictured below. 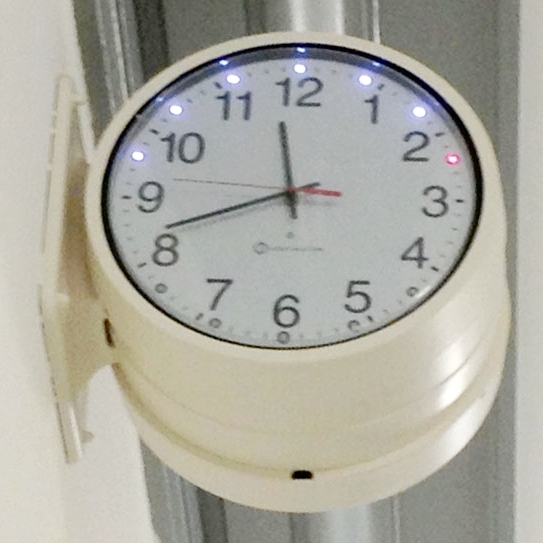 The clocks were installed in 1963 (now with lights!) and replaced many of the historic timekeeping systems throughout the Capitol complex. The brass art deco buzzer design dates to 1965 and is an ever-present fixture of the vast Rayburn House Office Building. The legislative codes can be perplexing even for veteran lawmakers. Rep. Mo Udall advised new members in 1977 to "be prepared for total confusion and some panic when the bells start to ring. (Actually you'll hear a buzz -- 'ringing' is a quaint anachronism.) Here's an example of the bells' complex messages. Two bells followed by six rings means that there is a first vote on a measure being considered under suspension of the rules. Got that?" Some members of congress carry little cards in their wallets to remind them which code means what, but others rely on staffers to text them the decoded messages. Tourists and interns typically endure the ear-piercing buzzer calls in bewilderment as lawmakers gallop past them on the way to a vote. There have been well-reasoned proposals to replace the archaic bell system with a dedicated phone line or a smart phone app, but neither of these took off. Congress has its own way of doing things.